This fancy teapot stands at 3 1/2' tall and has a floral filigree design throughout. The leaves are very dark green, almost black, but the flowers add a touch of color; and the crystals add a touch of sparkle. 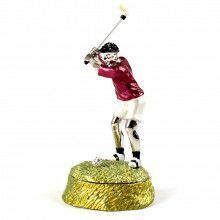 This lovely keepsake is made from pewter and has been 24 karat gold plated. It opens easily with a hinge, and closes securely with a magnet.